MUSIKMESSE 2015: Mackie has some new mixers in Frankfurt - version 2 of its ProFX series mixers, to be precise. These feature a new preamp design and a new effects engine, while new 4-channel and 30-channel models have been added to the range. Read on to find out more, and also get the lowdown on the Mackie website. 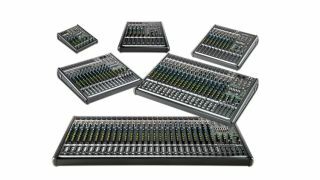 "Musicians and professional engineers have come to rely on Mackie ProFX mixers to deliver the complete feature set and unwavering performance they need for their live sound applications," commented Matt Redmon, Mackie Sr. Product Manager. "With ProFXv2, we've not only expanded the lineup, we've invested heavily in elevating the sonic performance of the series. ProFXv2 mixers sound amazing and, as always, are available at an extremely attainable price." Also contributing ProFXv2's excellent sonic performance is the all-new ReadyFX™ effects engine. This immensely powerful new engine employs floating-point DSP, designed for the intensive processing of high-quality audio signals. With more horsepower and all-new algorithms, ReadyFX delivers results that add depth to any mix, with premium sound that elevates live performances. Each ProFXv2 mixer features a choice of 16 reverbs, choruses and delays, each extremely useable for a wide array of sonic applications. ProFXv2 delivers a no-compromise live mixing toolkit that eliminates the need for expensive rackmount gear. It's ideal for situations where purchasing extra gear is cost-prohibitive and the result is a simple setup that can easily be run by novices, but offers all the right tools for in-house engineers. Each ProFXv2 mixer features multi-band GEQ, critical for tuning mains to get the best possible sound in any venue. Onboard GEQs are also great for eliminating nasty feedback from stage monitors. Each model features a flexible mix of I/O and, with six models available, covering applications ranging from 4 to 30 inputs, there is always a ProFXv2 mixer right-sized for your application. ProFXv2 mixers also feature built-in USB recording and playback*. Users can record the live mix for distribution to the audience, be it a band's fan base or a House-of-Worship congregation. It's also perfect for music playback in any live sound situation. Just connect the ProFXv2 mixer to a Mac or PC and stream music directly to the house during performance breaks. It's ideal for band rehearsal also, as musicians can capture their ideas and improve their live performances. The ProFXv2 series expands on the models available in the line with the new ProFX4v2 and ProFX30v2. The ProFX4v2 is the most feature-rich ultra-compact mixer on the market. No other mixer of this size and price features the comprehensive toolkit that ProFX4v2 provides. It's ideal for cafès and other small performance venues. It's also perfect for vocal-only reinforcement in band rehearsal spaces. The ProFX30v2 extends the line into truly professional applications. It's ideal for live sound venues looking for a higher-channel count solution without needing excess outboard gear. Bands that bring their own PA to the venue will also appreciate the flexibility and power of the ProFX30v2. Mackie ProFXv2 series mixers will be available beginning May 2015. The comprehensive series includes six models to cover a wide range of applications. The ProFX4v2 has a U.S. MSRP of $169.99. The ProFX8v2 has a U.S. MSRP of $299.99. The ProFX12v2 has a U.S. MSRP of $359.99. The ProFX16v2 has a U.S. MSRP of $629.99. The ProFX22v2 has a U.S. MSRP of $809.99. The ProFX30v2 has a U.S. MSRP of $1149.99.